Disability Sport NI is the lead development agency in Northern Ireland for Boccia and is a member of Boccia UK. Boccia has been a Paralympic sport since 1984 and is specifically designed for athletes with a disability affecting loco-motor function such as cerebral palsy. At recreational level though Boccia is played by people with a range of disabilities. 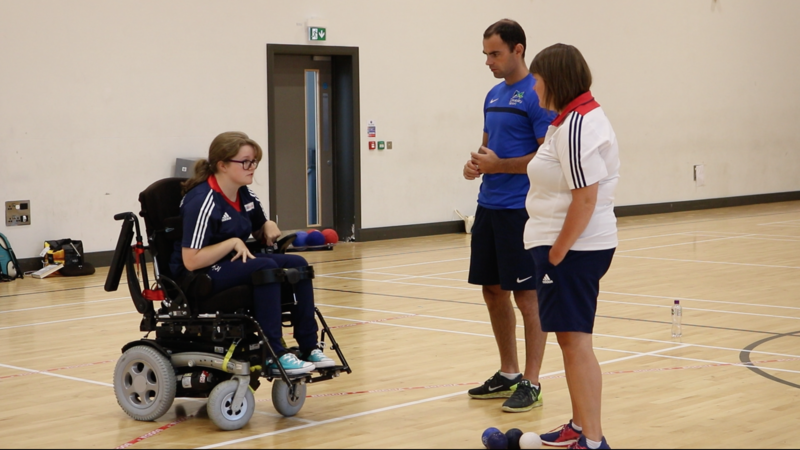 Please CLICK HERE to see a video of Boccia being played. There are 7 Boccia clubs across Northern Ireland that are aimed specifically at players who meet the Paralympic classification. For further information on classification please CLICK HERE. The clubs provide an opportunity to play both recreationally and competitively against other teams and in the Northern Ireland Boccia league. For further information or to find a boccia club please visit the Find a Disability Sports Club section of our website by CLICKING HERE. The Northern Ireland Boccia League, which is organised by Disability Sport NI provides monthly matches between October and March each year in various locations across Northern Ireland. This league is open to teams of three, made up of players with physical disabilities including one person with cerebral palsy. Disability Sport NI delivers the Northern Ireland Boccia Squad programme and supports Northern Irish athletes competing at International level. Disability Sport NI currently supports 1 local athlete accessing the GB Squad. Claire Taggart - Player on the GB Development Squad and 2016 Rio Paralympian.